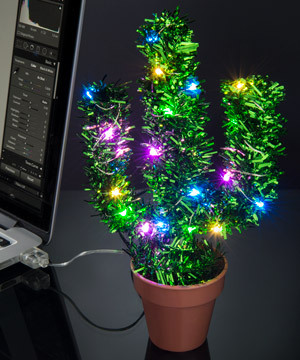 Holiday Cactus: A holiday desk saguaro that lights up. Every holiday season, it’s always an anxiety-inducing chore to find just the right one, cut it down, bring it home, deal with all the needles, and decorate your cactus. But having a traditional Holiday Cactus in your home or office is now as easy as plugging it in! This tower of tinsel has 30 tiny multi-colored LEDs that, when plugged into a USB power source, really light up a drab desk. So think warm but stay festive, and spruce up your workplace or home with a Holiday Cactus. If your home or office feels like a holiday desert, there's no faster or more festive way to let the spirit of the season grow than a Holiday Cactus. This tinsel and wire decoration is Santa's favorite saguaro. 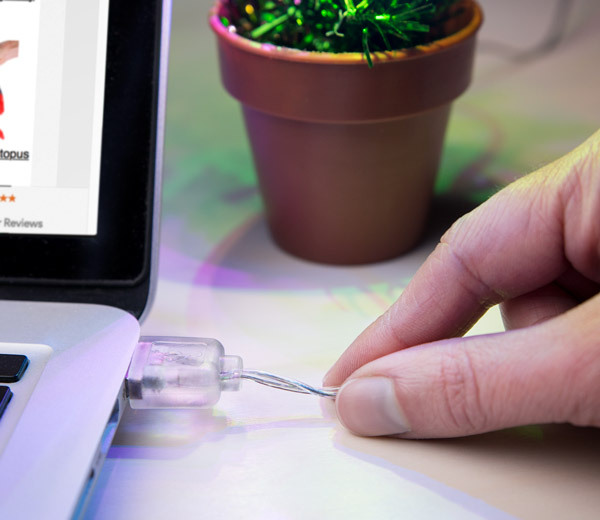 Plug in the simulated succulent to radiate an atmosphere of joy from the 30 integrated colorful LEDs. Like Santa's elves, the Holiday Cactus has the power to spread Christmas cheer despite being short in stature. 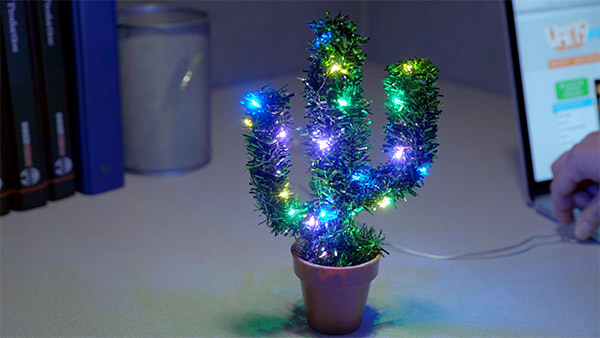 Standing at 9 inches tall, the weighted base keeps the cactus proudly upright as the yellow, green, blue, and violet LED lights brightly shine. 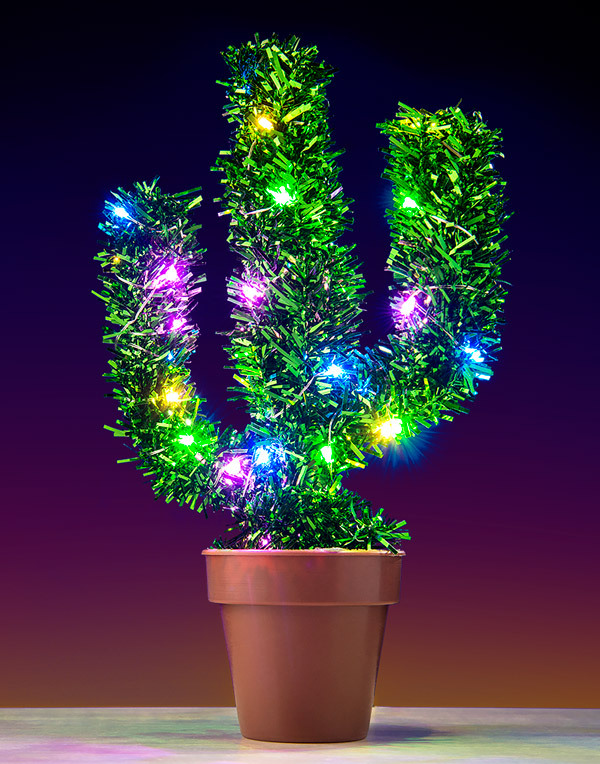 You won't find any sharp spines on this Holiday Cactus, but you will find a USB Type-A USB cord to power the tree. The three-foot long cord is permanently attached to the pre-strung tree, so all you need to do is plug it into your computer or wall adapter and enjoy the Mojave merriment. USB powered with a 3’ cord. Question: Can I hang ornaments on it? Answer: Sure, but you'd need some pretty small ornaments! Question: What if I want a mini Christmas tree instead? Answer: Then you should get a Mini Christmas Tree instead.